Should I fertilize the plants in the pond. or just buy more goldfish? oooh, pretty flower...ugh, what's wrong with the lettuce? 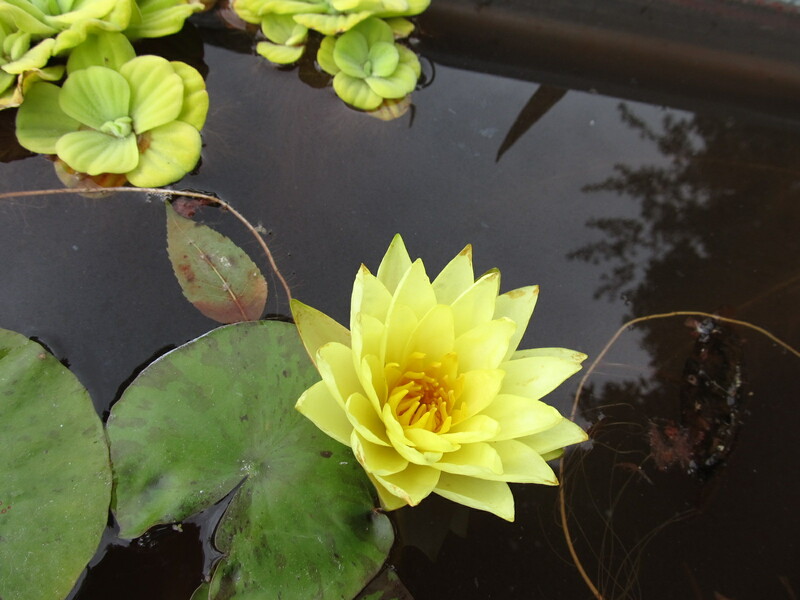 My water lily just bloomed- a lovely yellow flower, and I notice that the bloom is the same shade as the water lettuce and the water hyacinth. That’s not good. They are supposed to be a much richer green. My pond book recommends fertilizer spikes for potted plants, but these two are floaters- they have massive furry root systems that absorb nutrients from the water. Nutrients such as fish poo. I won’t put fetilizer in the water of the pond itself, because that would be hazardous to the fish. I put 5 comet goldfish in the tank at the beginning of the summer, and have removed one corpse- the other fish are nowhere to be seen, but I am assuming they are alive- Shrodinger’s cat, I guess, if I dig around in the pond searching for them, does that change the outcome? Maybe I don’t really understand what Shrodinger’s cat is all about. http://en.wikipedia.org/wiki/Schr%C3%B6dinger%27s_cat In fact, I’m pretty sure I don’t. Google has helped me once again, though, by suggesting that I put some fertilizer in water in a bucket, set the plants in them overnight and see if that helps. About half the plants are soaking now- we’ll see what happens.